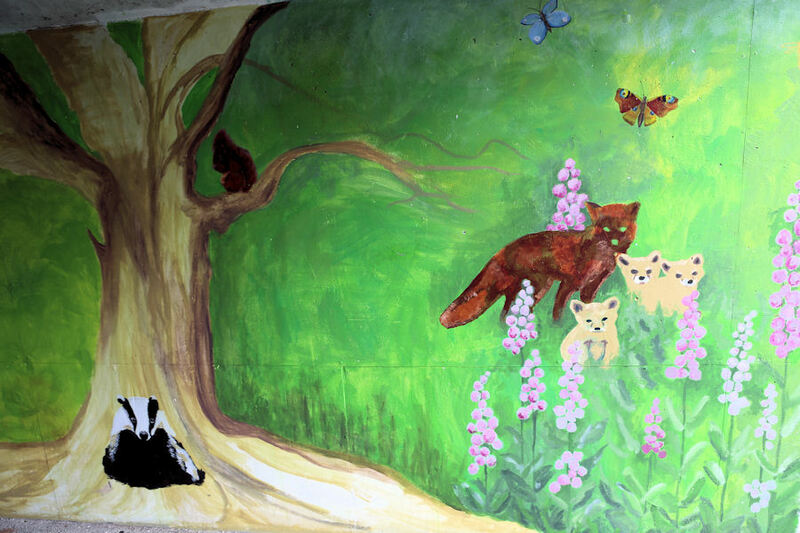 Students from the Camphill Trust based at William Morris House, Eastington recently completed a mural under the bridge that carries Downton Road over the Stroudwater Canal at Stonehouse. 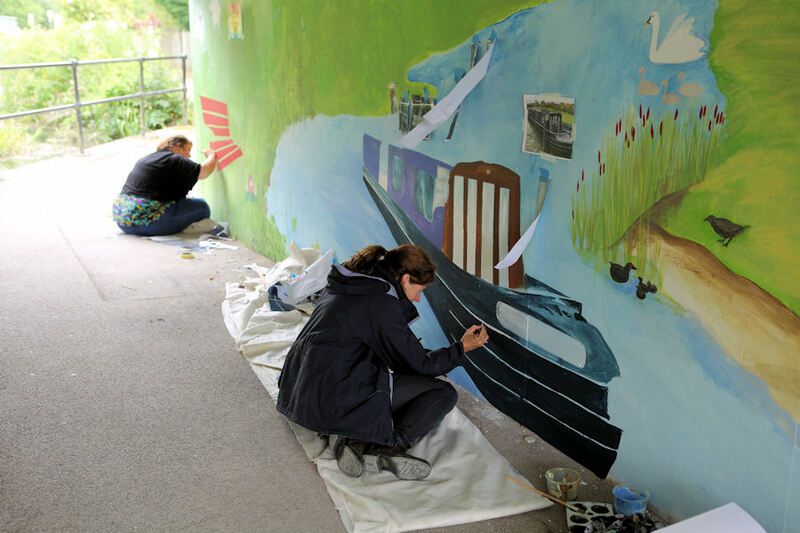 This is the latest example of Stroud District Council volunteer coordinator Paul Weller’s project of using colourful murals on bridge walls to enhance the canal side environment. Paul explains, “We have involved local schools, colleges and businesses to improve things for people using the canal towpath. “Our students are young adults with learning difficulties. Paul Weller came to the college and explained to the students and staff that we could all be involved in producing a mural on the wall beneath the bridge. "Paul explained that the local paint company, Bailey Paints of Thrupp, supported the project. All we had to do was supply the brushes and creative talent to use them. So, we all set too and had a big discussion and sketching session. The group decided to concentrate on what could be seen on the banks of the canal. Animals, birds, flowers and trees… oh! and benches. "The students and staff alike just loved the whole experience. Before each session we all gathered together under the bridge and said what some might call a bit of a prayer. The words went something like… 'Let us put all our love, joy, happiness and thought into what we do to cheer up the passers by' And it seems to have worked from what the local people say." "The kind and encouraging comments made by towpath users of all ages were a joy. In fact it became so busy at one point that we had to deploy a staff member and student just to deal with the explanations and thanks as well as to keep the way clear for other walkers and cyclists. "It was indeed a very interesting project. It opened our eyes to what is to be seen on and around the canal. Whilst we all agreed that the main theme was to be canal side wildlife… one of the students spotted a water snake swimming across the canal. So that just had to be included! "Stonehouse Bridge is another piece of artwork designed and completed by local students using materials supplied by a local company to benefit the local community. We haven’t finished yet though. We are in negotiation with Stroud College. We have invited them to take on the challenge of Stroud Brewery Bridge. It has a long high wall that could portray a colourful and lasting story of the history of the area. Watch this space as they say! Click here or on the icon below to find out more about Bailey Paints of Thrupp. Click here or on the icon below to find out more about Camphill Trust.